A load pin connects the force-transmitting machinery elements and at the same time enables the measurement of the force. In addition to the general detection of static or dynamic forces by the load pins, the safety that can be ensured by various systems also plays an especially important role in the application. Side note: What is meant by safety? Safety is generally the absence of danger and risk, but this condition depends on many factors and cultural interpretations. Ensuring safety is always only possible temporarily, locally and situationally. For this purpose, so-called “safety concepts” are created and implemented so that expected as well as unexpected interferences are made sufficiently unlikely. Direct safety ensures that, in the event of the failure of a machine, components are shut down in such a way that eliminates further danger to people and does not damage the equipment (redundancy, fail-safe or safe-life). The indirect safety prevents collisions and contact with moving machine parts. Measures here are, for example, covers as structural protection and also sensors that switch off the machine as soon as defined limits are exceeded. Such sensors can be found in everyday life, as in modern lawn mowers, for example. Finally, there is the indicative safety, which is indicated by signs or symbols on hazards. In the application of the safety systems referred to in this article, in which load pins play a central role, there are two main issues: on the one hand, the direct physical safety of the people involved and, on the other hand, the failure-free and hazard-free functioning of the machinery. Components must not lose their functionality due to overload or material failure. Almost exclusively, here we are dealing with direct safety. For this purpose, it is basically very simple and cost-effective to build load pins with a redundant output. For people who are in immediate proximity to moving loads, these pose a fundamental danger. 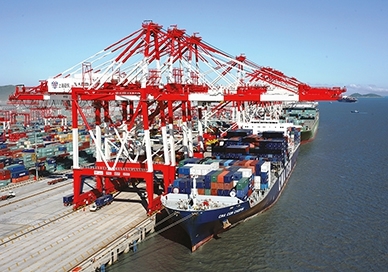 This can be, for example, containers in ports that are being loaded. Likewise, in theatres, suspended elements, such as lighting fixtures or stage structures and backdrops, that hang above the actors pose a threat. To ensure safety anyhow, direct safety precautions must be taken accordingly. Load pins are used in stage technology and similar applications for load measurement, overload detection and slack rope detection in the over- or understage machinery or they are used directly as torque support for drives. All load pins fulfil the stage technical standard in accordance with DIN 56950-1. For maritime applications, the load pins are approved in accordance with the requirements of DNV GL. The F53 series of load pins are tested to DNVGL-ST-0377 (standard for shipboard lifting appliances) and DNVGL-ST-0378 (standard for offshore and platform lifting appliances), meaning they are excellent for lifting applications in the marine and offshore industries. The load pins go hand in hand with the ELMS1 safety electronics, which meet the requirements up to SIL 3 / PL-e. The overload safety system is multi-functional, configurable and modularly expandable. It consists of a central module and individually expandable function modules, which are connected to each other via a redundant standard rail bus. 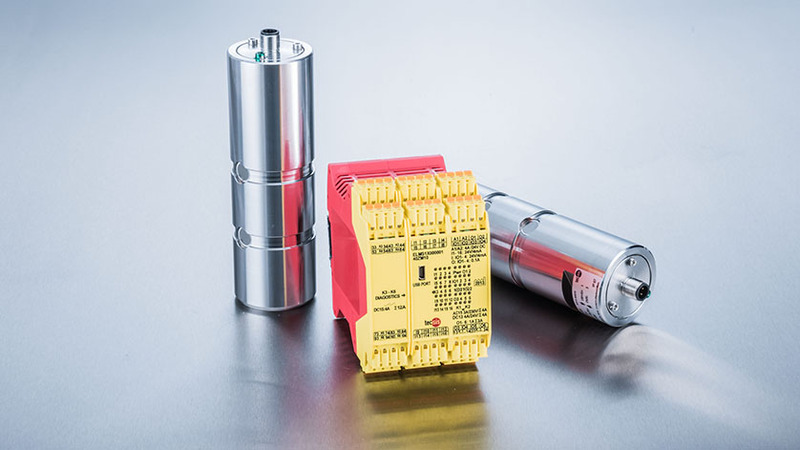 Up to four redundant load pins as well as safety electronics and software can be connected to the system. The overload protection of cranes which do not have a stability risk is also greatly simplified. An automatic adjustment of the total load of the load pins leads to a switch-off when the limit value is exceeded. The combination of electronics and load pins can generally be used on lifting gear and acts to prevent danger. It protects both the operating personnel and the equipment itself. As a result, the EU machinery directive 2006/42/EC can be easily implemented. This requires that machines with a maximum load capacity greater than or equal to 1,000 kg or a tipping moment greater than or equal to 40,000 Nm are equipped with devices which warn the driver and prevent a dangerous movement. This can happen with overloading by exceeding the maximum load capacities, by exceeding the maximum load torques or by exceeding the tipping moments. The use of suitable systems with load pins and safety and overload electronics ensures trouble-free operation in a wide range of industries, where the protection of people, the reliability of applications and the protection of machinery are important. In our article about load pins you will get to know the versatile application possibilities of this technology. Further information on the subject of load pins and further force transducers can be found on the WIKA website.